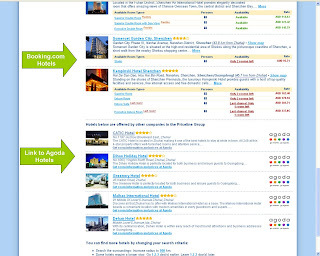 Below this line is a list of hotels in the same destination but provided by Agoda not Booking.com. A click on one of those pages sends you to the Agoda booking system (ie link relationship and white label not full inventory integration). This is the first hint of integration between the Priceline owned Asian based Agoda and Euro based Booking.com. This is not a full back end integration like we have just seen for AsiaRooms and LateRooms. Mainly because it will be much harder with Agoda and Booking operating on different models (merchant vs commission) and I think that Agoda's owners are still in the earn out process part of the sale to Priceline. When the sale was announced in 2007 the earn out period was listed as three years. Integrations during earn outs are hard as the business working under the earn out is completely focused on achieving the earn out targets rather than internal integration needs. As the earn out period starts to close (ie end of this year), I expect to see even more integration between the two businesses.